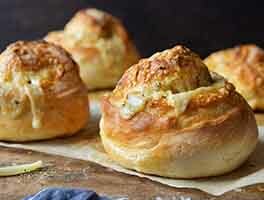 These soft, savory rolls are equally delicious for dinner or sandwiches. 2 hrs 40 mins. to 3 hrs 45 mins. Mix and knead all of the ingredients (except the onions), by hand, mixer, or bread machine, until you've made a slightly sticky, shiny dough. Knead in the onions, place the dough into a greased bowl, cover, and let rise in a warm spot for 1 to 2 hours, until it's grown by at least one-third. Transfer the dough to a lightly greased or floured work surface and divide into 12 pieces. Roll each piece into a ball and place in a greased 9" x 13" or 12" x 12" pan. Cover the rolls and let rise 1 hour, until puffy looking. Preheat the oven to 425°F while they are rising. 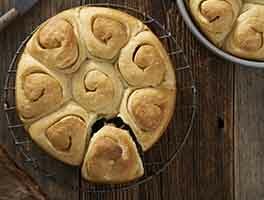 Reduce the oven heat to 350°F, place the rolls in the oven, and bake for 15 to 20 minutes, until golden brown. Remove the rolls from the oven, brush with melted butter, and serve warm. Store the cooled rolls in an airtight container for 5 days or well-wrapped in the freezer for up to a month. 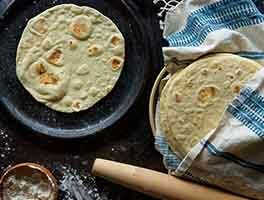 To bake these rolls in a crown bread pan, prepare the dough as instructed, dividing it into eight equal pieces rather than 12. Roll each piece into a ball and place into the lightly greased wells of the base of the pan. Cover the rolls with lightly greased plastic wrap and allow them to rise for about 1 hour. Remove the plastic wrap and bake the rolls (with the lid on) in a preheated 425°F oven for 20 minutes. 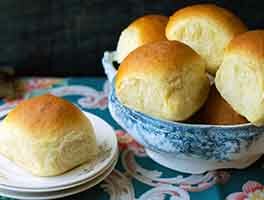 Remove the lid and bake for another 5 to 10 minutes, until the rolls are beginning to brown and a digital thermometer inserted into the center of one roll reads 200°F. Remove the pan from the oven, allow the rolls to cool in the pan for 10 minutes, then turn them out of the pan and brush them with melted butter. I made this this morning. I used my baking stone instead since I don't have the crown bread pan. I baked for 18 minutes and left them in the turned-off oven for about 5 minutes or so. I am not sure if I did it right. The rolls have rich flavor but are quite dense. Any tips? What do you do if you don't have the Emile Henry Crown Bread Pan. 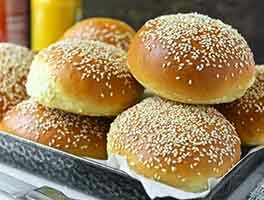 These are nice tasty sandwich rolls. I made the recipe that I tore out of the KA catalog, which is slightly different. It does not call for vital wheat gluten, and calls for Rye Bread Improver (which is what I used) rather than Deli Rye Flavor. Not having any black cocoa, I used Double Dutch Dark cocoa, which gave the dough a grey hue that I didn't like. I added a half teaspoon of espresso powder and they turned out a nice brown, almost as dark as in the picture. I subbed 34g of potato flakes for the potato flour, and used dried minced onions. I made 12 rolls rather than 8 as the older recipe directs since I wanted small sandwiches for a Super Bowl party. I flattened the dough balls to a half inch or so on the cookie sheet before the second rise, so they were a better shape for sandwiches rather than round like a dinner roll. The ham sammies were great! yup, agree the breadmaker is the way to go for the first rise. i think i used crap dried onions (mccormacks), they gave the bread a kind of tinny chemical taste. next time i'll get my onion flakes at my local indian store, probably half the preservatives. i agree, great for ham sandwiches. Nice, fairly quick rye rolls. For dinner rolls, I would make more, smaller rolls next time. This is delicious. Although I had issues with rise, I'm pretty sure that was due to my own laziness. Meanwhile, having to use what I had on hand, I used dark rye with a dash of cocoa instead of pumperknickel and wheat gluten instead of improver. Used dehydrated minced onions. Had only a Tblsp of molasses left so I used that and 1 T honey. The flavor is wonderful....this would make great ham or tuna sandwiches or serve as a really different hamburger roll. The temperature of my house(our own igloo) really does require proofing the yeast- especially since I store it in the freezer- which I didn't, but I certainly will on the next batch. What a fantastic recipe for my first foray into the world of rye! I used gluten & omitted the deli rye flavor because I didn't have any on hand. Because of this, they didn't have the "traditional rye flavor" I was expecting. No matter, the flavor was fabulous! These were a big hit with our kids (2,3,4, & 5 yrs old), which kind of surprised me. They were perfect for Christmas dinner & made lovely leftover ham sandwiches. I used dried minced onion from the grocery store, somewhere between 1/8 & 1/4 cup. They were pretty onion-y, which is great. :D Also, instead of baking them in a pan, I shaped them into tight balls & baked them "separated" on a cookie sheet. I didn't flatten them out or anything & I loved the "puffy" shape they took on. Reminded me of bread you would find in the bread basket at a high-end steakhouse. I think I'm going to make a hybrid of this & the "cocoa" pumpernickel recipe next using the rye bread improver that just arrived. 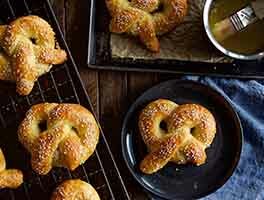 Thanks for yet another great recipe, KAF, & for all of the wonderful inspiration! These turned out perfectly. The dough was so easy to work with and I love the soft squishy texture. Absolutely beautiful! This recipe is very forgiving! I made three mistakes. Number one; I forgot to knead in the onions. I took the dough out of the oiled bowl (I was at the first rise), kneaded them in, then decided the dough was too dry.Back in the mixer it went. Added a tablespoon more water, kneaded all over! At this point I'm thinking, if this works it will be nothing short of a miracle! On to forming, rising and baking. I forgot to turn oven down until they had baked for ten minutes. I just turned them out. Beautiful! Taste fabulous! I guess miracles do happen!